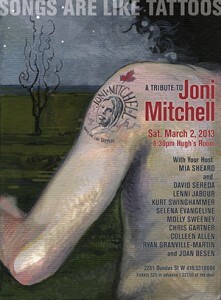 Pleasure to be in the house band and front a couple of my favourite Joni Mitchell songs at the annual Songs Are Like Tattoos tribute cabaret at Hugh’s Room in Toronto. This is year it was sold out, once again. Poster by the one and only Martin Tielli.